Introduction: Complications in ureteroscopy (URS) occur at a low incidence and most are minor but still major complications do happen. It is the responsibility of the surgeon to be able to recognize and manage these complications whether they occur intraoperatively or postoperatively. 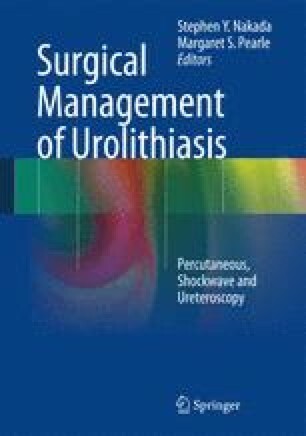 Discussion: URS is a major treatment modality of the modern urologist and is used for the treatment of upper tract calculi and urothelial cancer. Technologic advancements and smaller instruments have lowered the incidence of complications of URS but they still occur and in some instances can lead to significant morbidity and even mortality. URS complications can be broken down into intraoperative and postoperative categories and further broken down into major and minor complications. Intraoperative complications include: bleeding, thermal injury, technology failure, submucosal or lost stone, ureteral perforation, ureteral avulsion, mucosal injury, and false passage. Most of these injuries are minor and easily recognized during the procedure. Usually prolonged ureteral stent placement will help heal these injuries but they can lead to strictures postoperatively so these patients must be followed with serial imaging. Ureteral avulsion typically requires a delayed sometimes complex reconstruction procedure. Postoperative complications include: infection or sepsis, transient vesicoureteral reflux (VUR), and ureteral stricture. VUR usually resolves with just observation. Ureteral strictures can lead to loss of kidney function if not treated by either endoscopic or open/laparoscopic means. Infection and sepsis can often be prevented by preoperative and perioperative measures, but if they occur, early recognition and treatment improve outcomes. Conclusion: Complications after ureteroscopy have a low incidence and are mostly minor but major complications can occur. Most of these complications can be treated with conservative management but some require adjuvant procedures. An important tool for any physician is the ability to recognize these complications and treat them accordingly in a safe manner that is best for the patient. Furthermore, awareness of these complications allows for understanding of the strategies employed to prevent their occurrence. American Urologic Association [homepage on the Internet]. Baltimore: Best Practice Policy Statement on Urologic Surgery Antimicrobial Prophylaxis; 2008. (Reviewed and validity confirmed 2011, updated February 2012). AUA Guidelines for Antibiotic Prophylaxis. Available from: www.auanet.org/content/media/antimicroprop08.pdf.